Virtual Reality has a huge potential to change lots of things in our world, including the way we can be with friends, anywhere, no matter where they may be in the real world. Facebook is betting huge on VR - as proved by the Oculus acquisition - and it's now showing us how VR can change social networks in the future. Although most VR projects are currently focusing on a single person experience, the possibilities have a far greater reach when we consider what can be done for multiple users, such as the demo that shows how friends can "meet" in any place in the world, no matter where they really are. 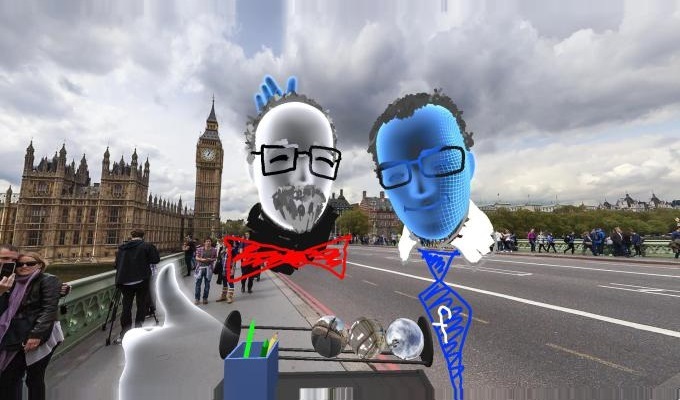 Using VR, you can schedule a meetup in London, or Cairo, or anywhere else, and have your friends pop up, even if they're actually in different continents. Although you can do the same via a chat room or group video call, VR lets us interact in a (almost) physical way. There's also a nice touch in the demo, where our virtual avatars take a virtual selfie, and share it on Facebook by placing the photo in a "Facebook box" - something that shows us the sort of VR interfaces we'll have in the future, in a VR world where buttons made for mouse clicking won't be the best way to do things. At the same time, this demo shows one of the biggest problems with the current Oculus Rift kit. The entire demo relies on having tracked hand controllers that allow us to have "hands" in the virtual world. Something that isn't included in the Rift kit being sold (unlike the HTC Vice, which includes such controllers.) That will be a big let down for first generation adopters... and we hope Oculus rectifies that sooner rather than later.